Pretty soon, this question will consume you, and you will find yourself thinking about how to increase your engine’s output every waking moment. Sometimes, even in your dreams. Okay, maybe that’s just me. But if you really want to know, or if you want to do any tuning, or have your car tuned, you will need to seek out a Dyno. Fortunately for us, Logic Imports, the Cobb Protuner for Colorado is just a stones throw down the street from us, so once the time came to find out just how much, or how little power the Project Car was putting down, we didn’t have far to go. First a word about Dyno’s. There are a lot of different Dynamometers out there, and many of them use slightly different means to calculate Horse Power and Torque. They are all going to be similar, but keep in mind there a lot of factors to change your final numbers. For instance, the Dyno has to be calibrated to read accurately, but over time, they can fall out of spec. Weather conditions, such as temperature, humidity, and altitude can also play a huge roll in your car’s power out put, which brings up the dreaded “correction factor”. The Society of Automotive Engineers has come up with a way to calculate what power your car would make on a Dyno at sea level under ideal conditions using information such as temperature, humidity, and altitude. My point in telling you this is to say that all Dyno’s will read differently. If you took your same car, on the same day to two identical Dyno’s across town, you will most likely get different numbers, even though you haven’t changed a thing on your car. And as far as correction factors are concerned, ideally this would give us a standardized Horse Power number that we could compare with other cars. However, sometimes the correction factor is exaggerated to show a higher number, so you have to take them with a grain of salt. Well, first, don’t get obsessed with big numbers. This is going to be hard. Really hard. What you should really focus on from a tuning stand point is not what your peak horse power is, but how much it has changed after you got tuned, or put an exhaust on, etc… Of course, to do this, you will need to start with a baseline Dyno pull, and then go back to that same Dyno each time you want to have your car Dyno’d or tuned so that you have consistent numbers to compare. For this reason, it is a good idea to build a relationship with the person that is doing your tuning, etc. For our Project Car, we started out with a baseline dyno run, which you can see here. This is pretty typical for a stock 2.0 Liter WRX, which is pretty good concidering that we now have 66,000 miles on the clock. Notice that the Torque (the solid blue line) peaks at about 4,000 rpm, then falls down, and is mostly gone by 6300 rpm. Also notice how our peak horse power doesn’t come on till about 5400 rpm, and also falls off completely by about 6300 rpm. Then we loaded up the Cobb Stage 1 map with our Access Port. We got a 19 horse power increase, which is great, but notice how much smoother the torque curve is. We have more torque throughout the rpm range, and because of that we are making a lot more horsepower in the higher rpm’s where the stock tune was falling off. Then Kris put together a Protune, and we ended up with this. He was able to get another 10 ft/lbs. of torque, and 10 horse power, and still maintained a very flat torque curve so power delivery was very smooth. Remember this is a totally stock car, with no exhaust mods at all, and we have increased its output by nearly 30 horse power. Then we put on our Prodrive Flex Up-Pipe, and my MRT Exhaust, and re-flashed the car to a Cobb Stage 2. We are only getting 8 more horse power more than the stage 1 Protune, but 18 more than the Cobb stage 1 tune. But notice how much sooner we are able to make our peak torque. We make 210 ft/lbs. of torque almost 500 rpm’s sooner than with the stock exhaust, and because we have less restriction, the top end horse power is better too. 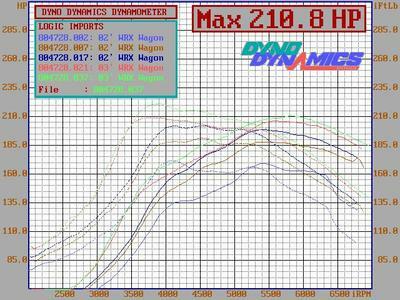 Kris then made a stage 2 Protune. He was only able to get another 4 Hp, but got another 20 ft/lb of torque. Notice how much earlier the Hp comes on too compared to the base stage 2. Even though we weren’t able to make lots more power, I am very happy with the tune. The power comes on much sooner, and compared to stock (the light blue line at the bottom), this is virtually a whole new car. The car is so different from what it was, it's almost hard to compare, but what I will say is that acceleration is much smoother, and almost explosive compared to what it was before. The car was fun before, but now it is hard not to have a silly grin every time I step on the throttle. Not to mention the exhaust note is much improved too. It is pretty clear though too that the turbo is running out of air over about 6000 rpm’s, but that will be for another installment. Also, of course we did all this to get the car ready for Cobb’s track day. People have asked how a tune will affect your mileage. Well I averaged just over highway speeds out and back with the air conditioner on, and still got just over 29 mpg. Now, at the track, I only got 16 mpg, but that was pretty much full throttle all the time I was out there. So just because the car makes substantially more power, it doesn’t necessarily need more gas. But of course, mileage in any turbocharged car is mostly dependant on driving, so I will keep track and see what it is after a few more tanks. Well, I am very happy with the power that the car is making, and since the next step will involve upgrading the turbo, intercooler, and injectors, I think we will go back to tweaking the suspension for the moment. Stay tuned because I am finally going to write that Sway-Bar article that I have been promising. Once again, I have to thank Kris from Logic Imports for all his help tuning the car, and putting on the Up-Pipe and Exhaust.It made for a late night, but the results speak for themselves. Your peak horse power increased significantly. You did some tremendous tuning on it. Good job! It is really good to learn the dynamics of the cars. You appreciate more how your car works and you would be able to handle with utmost care. The graphics are well presented. Your dyno seems to be calibrated well seems the tuning that you do is directly in relation to its output. Bringing out the power in cars is extremely hard and there are lots of ways to do this. With proper tuning like that it is definitely gonna perform well. Good job! This article has good description and pictures shown for the better explanation. One time I tuned my car and was really so excited about it I can't sleep through the night. I was imagining and wondering about a lot of things on the performance that it will achieve after tuning. Glad I have found the right air intake and other parts for it. Our headset had been just as beautiful while within the photo. Things appeared quickly. I'd advise getting a towel more than every coating while you hit that over w / the best vapor iron. It does not steam off through merely a steamer. All iron ended up being required. It is very fine, when you never trust personally using the towel and vapor iron, and then take that up to a pro. Perfect seem.